While modern medicine produces miracles, it also delivers care that is too often unsafe, unreliable, unsatisfying, and impossibly expensive. For the past few decades, technology has been touted as the cure for all of healthcare's ills. But medicine stubbornly resisted computerization - until now. Over the past five years, thanks largely to billions of dollars in federal incentives, healthcare has finally gone digital. Yet once clinicians started using computers to actually deliver care, it dawned on them that something was deeply wrong. Why were doctors no longer making eye contact with their patients? How could one of America's leading hospitals give a teenager a 39-fold overdose of a common antibiotic, despite a state-of-the-art computerized prescribing system? How could a recruiting ad for physicians tout the absence of an electronic medical record as a major selling point? Logically enough, we've pinned the problems on clunky software, flawed implementations, absurd regulations, and bad karma. It was all of those things, but it was also something far more complicated. And far more interesting . . . 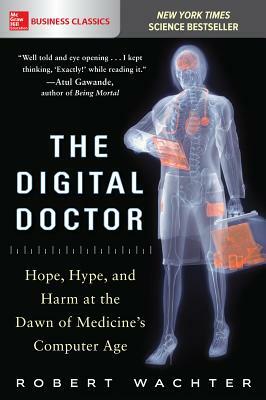 Written with a rare combination of compelling stories and hard-hitting analysis by one of the nation's most thoughtful physicians, The Digital Doctor examines healthcare at the dawn of its computer age. It tackles the hard questions, from how technology is changing care at the bedside to whether government intervention has been useful or destructive. And it does so with clarity, insight, humor, and compassion. Ultimately, it is a hopeful story. "We need to recognize that computers in healthcare don't simply replace my doctor's scrawl with Helvetica 12," writes the author Dr. Robert Wachter. "Instead, they transform the work, the people who do it, and their relationships with each other and with patients. . . . Sure, we should have thought of this sooner. But it's not too late to get it right." This riveting book offers the prescription for getting it right, making it essential reading for everyone - patient and provider alike - who cares about our healthcare system. Robert Wachter is Professor and Chair of the Department of Medicine at the University of California, San Francisco. Author of 250 articles, he coined the term "hospitalist" in 1996 and is generally considered the "father" of the hospitalist field, the fastest growing specialty in the history of modern medicine. He is past president of the Society of Hospital Medicine, past chair of the American Board of Internal Medicine, and a recipient of the Eisenberg Award, the nation's top honor in patient safety. For every year beginning 2008, Modern Healthcare magazine has named him one of the 50 most influential physician-executives in the U.S.; he was #1 on the list in 2015. He has been profiled in the New York Times and contributes regularly to the Wall Street Journal. The Digital Doctor is his sixth book.